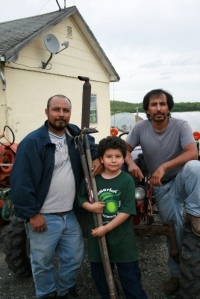 We are happy to announce that next Wednesday, May 26th from 6 – 8 PM will be our Farmer Meet and Greet, with Martin and Gaudencia Rodriguez of MimoMex Farm. This is your time to introduce yourself to the people growing your food, to get to know them, and to ask them questions about the farm! This event will take place at our distribution location, Hebron SDA Church at 1256 Dean Street on the corner of New York Avenue. Refreshments will be provided. This event is open to all current and interested members of the Central Brooklyn CSA, so spread the word to anyone who may be interested in joining.